Mysore is the traditional method for learning Ashtanga yoga as taught by the late Sri K Pattabhi Jois of Mysore, India. In a Mysore class, each student has an individualized practice which is developed and overseen by the teacher. Postures are learned one by one so that the student is able to memorize the sequence slowly and the body is able to adapt to the postures over time. During Mysore, students of all levels practice at their own pace and are given instruction verbally and through hands on adjustments. Mysore is suitable for students of all ages and abilities and is the traditional method of learning yoga, one on one from teacher to student. We invite you to come experience the meditative quality of Mysore practice. Mysore classes do not meet on MOON DAYS. We ask that students new to Mysore begin with our Intro to Mysore Workshop (one hour lecture) which is offered at the beginning of each month and supported by 8 Intro to Mysore classes which are to be used in 30 days. The workshop itself provides important background information about the ashtanga practice as well as logistical information including everything a new student would need to know about the Mysore classes. The Intro to Mysore classes which are included in the package are held at the same time as our regular Mysore classes listed above. However, the students in the intro classes are given extra time and individualized attention as they learn the ashtanga practice and become familiar with the mysore method. Students will be able to choose days/times from the schedule above that work best in their schedules. 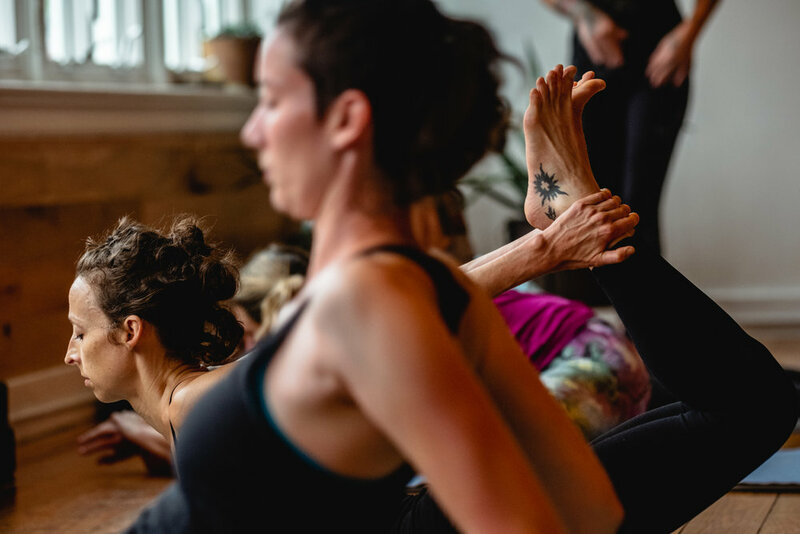 In the Mysore tradition, each student has an individualized practice that follows the ashtanga sequence which is developed and overseen by the teacher. Postures are learned one by one so that the student is able to memorize the sequence slowly and the body is able to adapt to the postures over time. This workshop is ideal for students of all levels wishing to develop a self practice or deepen their existing practice. You do NOT need prior yoga experience to start a mysore practice. See above for more general information about our Mysore program. Registration is required. *We are currently offering the MYSORE CHALLENGE in place of our Intro to Mysore Workshop & Classes. Start the New Year off right by immersing yourself in the Ashtanga Practice and experiencing the transformation possible by consistently showing up to your mat and yourself.